Our more modern Legion began with the efforts of Mary Gootee-Schafers, who came to Benedictine College having had a year’s worth of experience in a senior Legion while she was in high school. Most Pure Heart of Mary Praesidium and Queen of Victory Curia in Topeka, KS worked on preparing Mary for a leadership role for when she graduated from high school. When she came to BC she immediately expressed a desire to start a praesidium. She was counseled by the head chaplain and her spiritual director- Fr. Brendan Rolling, OSB- to wait a year before starting the Legion in order to adjust to collegiate life. So in the fall semester of 2010, with Fr. Brendan’s blessing, she began working to start the Legion of Mary. She placed fliers around campus for the first meeting and drew in four new members- three girls and one guy. Two of the girls attended a few meetings but eventually dropped out by the next semester. The three remaining members- Mary as president, the treasurer Julie Tacka, and the secretary Brad Geist, formed the main nucleus of the praesidium for the next two years. At the first or second meeting, Mary asked for a name for the new praesidium and Brad suggested Our Lady Seat of Wisdom, who was constantly invoked before classes at BC. He felt that it would be a good title of Mary to assume for a college praesidium and the others agreed. The motion was passed and the Our Lady Seat of Wisdom Praesidium received its name. 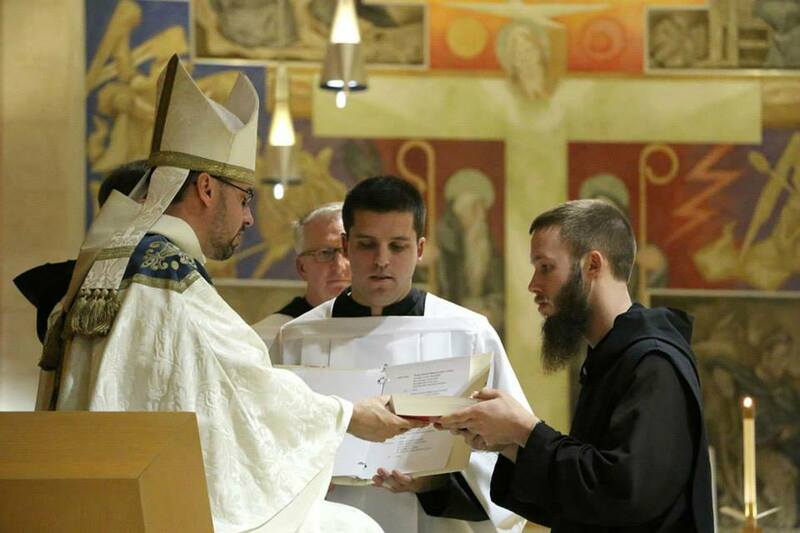 At the same time, the president of Our Lady Queen of Victory Curia in Topeka, Gus Torrez, played in active role in supervising and counseling the fledgling praesidium. Gus’s efforts have been nothing short of heroic, often making the hour drive weekly or every other week to attend the meetings to see how things were going and to offer his help when he could. The praesidium really wrestled with finding works and assimilating into a community that is already saturated with student faith groups. Many ideas were bounced around but no “core” works were decided upon. Among the things that were bounced around were ideas for taking communion to the sick, comforting the grieving, leading a 33 day consecration on campus and helping with special events at the campus Grotto. All of these ideas were either obscure or already taken by campus ministry. This led to a bit of a standstill in the Legion’s effectiveness and recruiting on campus. In late 2011, two Our Lady of Fatima statues were purchased for Pilgrim Virgin visits, though how exactly they were to be circulated through the dorms was unclear and remained for quite some time undecided. The most common work through this time was simply spiritual conversations with those we met. during this time. Things had begun to reach a point of crisis. Brad graduated in May of 2013 and Mary was left with just one semester left. That August 14th, the Eve of the Assumption, Brad entered St. Benedict’s Abbey, one of the co-founders of Benedictine College. He became a novice on December 7th, the eve of the Immaculate Conception and took the name Br. Benedict. During that time he became an auxiliary member, promising to pray for the Legion while he discerned monastic life. He was not allowed to actively participate in the Legion, since he was a novice and not allowed to take on any formal duties in or around the monastery. Meanwhile, Mary Gootee-Schafers found herself as the only member of the praesidium left. She found a friend who was willing to help keep the Legion going. The problem was that this friend was also a senior and had one semester more than Mary left. A couple more members were found. Mary graduated that December. The Legion continued the next semester but a heated argument occurred during one of the meetings on a topic that did not need to be discussed and the praesidium fell apart despite good intentions to keep it going. That next semester, Fall 2014, the Legion became non-existent. On December 8th, the Solemnity of the Immaculate Conception, Br. Benedict made simple vows at St. Benedict’s Abbey, adding the name of Mary to his name due to an ever-increasing awareness that Mary’s presence had come to define and shape his spiritual life. Shortly after that, Br. Benedict Mary petitioned Abbot James for permission to work with the Legion of Mary in the capacity of Assistant Spiritual Director to Fr. Brendan, who found himself unable to attend almost every meeting because of other obligations. Abbot James granted the request. At the beginning of the Spring Semester 2015, Br. Benedict Mary set to work. He had a very small hope that he would get enough members to fill all of the officer positions, something that hadn’t been done since the early days of the Legion. He didn’t have very many expectations, he simply wanted to help the Legion grow to a point where it could run on its own. His first move was to utilize the Spring Ministry Fair to get attention. The Curia President, Gus Torrez, and another legionary from Topeka came to help. Together they were able to gain enough interest that several students attended the first meeting held by Br. Benedict in the Moritz board room. Most of the students continued to return each week. After a couple of meetings, Br. Benedict asked if these members would like to take officer positions after a time or prayer. The Vice President and Secretary positions quickly filled and the Treasurer and President positions were filled a few weeks later. 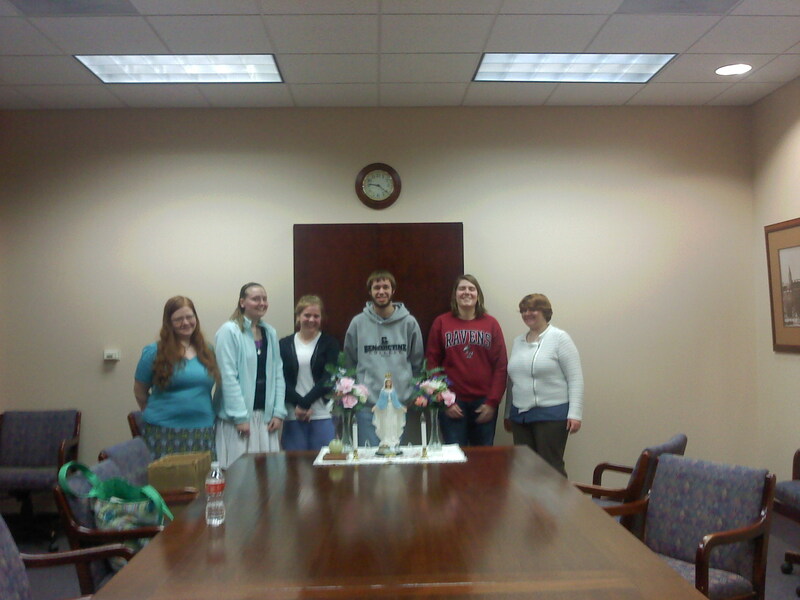 The students quickly agreed toward working to make door-to-door ministry in Atchison a major work of the praesidium. They also began taking the Pilgrim Virgin statues through the dorms, asking those that they met to pray a rosary in front of the statue of Our Lady with their roommate(s). 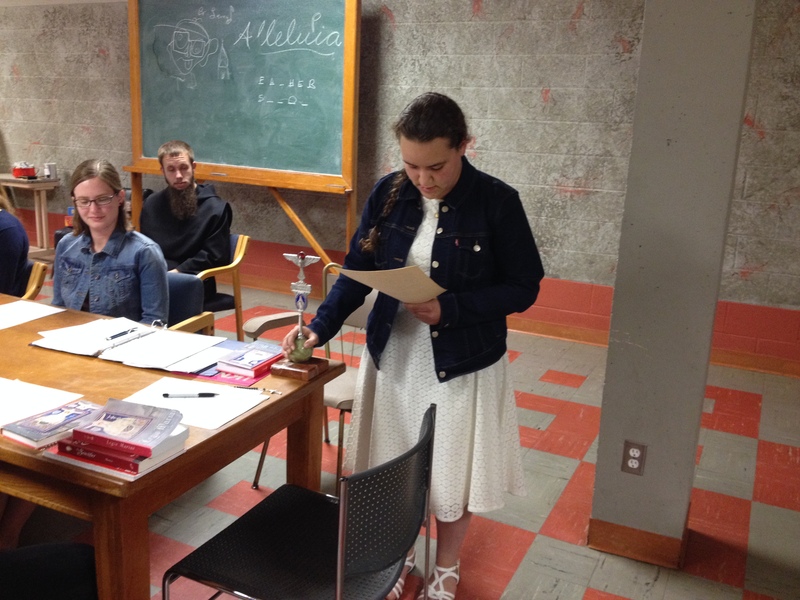 The new praesidium also began to choose nights in which the group went out in a concerted effort to knock on every door of the dorm and share the message of Divine Mercy to those they encountered. They also began to lead a chaplet of Divine Mercy on Friday afternoons at 3 PM. During Holy Week of 2015 one of the monks of the Abbey, after learning about the existence of the new praesidium, told Br. Benedict that he knew where the Vexillum from the old Legion of Mary was and gave it back. Ciera Peterson, the president, spent a good bit of Holy Week polishing and shining it to make it look brand new. We brought it out during the first meeting after break. During that meeting Br. Benedict brought to the praesidium’s attention that the Legion altar was on loan to BC from the Curia in Topeka. Through contributions to the Secret Bag over the semester, the Praesidium had enough to purchase a new statue and Br. Benedict encouraged them to do so. There was unanimous agreement. A new statue was ordered and, due to the generosity of an anonymous legionary, the altar cloth was also purchased from the Curia. Pretty soon, the entire altar set up belonged to the praesidium and was first used in its entirety for the meeting during which the Legionaries made their Legionary Promises. At the end of the semester, our praesidium gave its fond farewell to our secretary- Elizabeth Svejkosky, who was leaving to joing the Carmelite Sisters of the Divine Heart of Jesus in St. Louis, MO. She became the second religious vocation from the Legion (Br. Benedict having been the first). The Legion was happy to provide a handmaid to Our Lady of Mt. Carmel. As the semester wound down, Br. Benedict challenged the legionaries to get involved if they could with the Legion back at home, wherever they were going to. The praesidium also came up with a plan to get up and running the next semester, leaving the praesidium looking better than any other time in its history. That summer Br. Justin, who lives in Alaska, got in contact with the Curia there and began learning door-to-door ministry. Near the end of the summer, he was asked by the president of the curia to start a new praesidium at his home parish. He obliged and acted as president until it was time to leave for school. When he left, the praesidium he started already had 9 members. 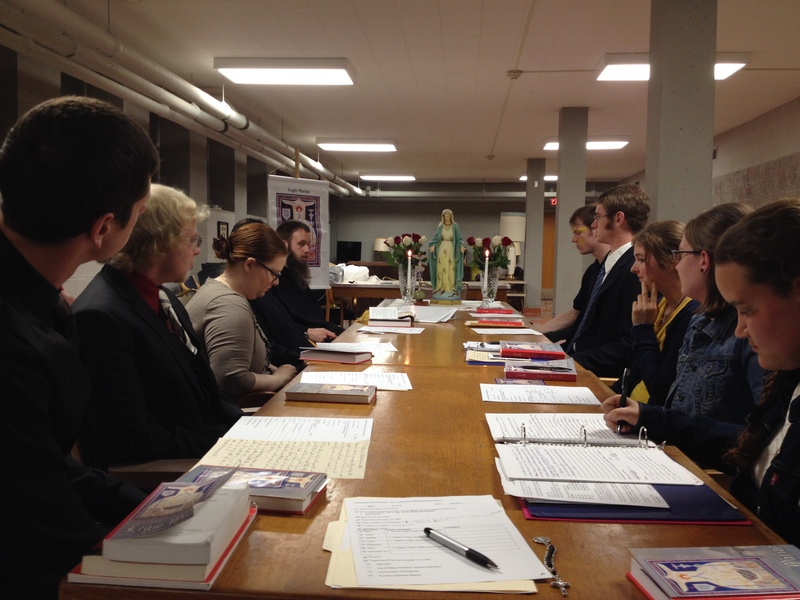 Our president, Sr. Ciera, also got in contact with her local curia in Lincoln, Nebraska and began working with them as well. She also wanted to start a new praesidium at her parish, but had to wait due to a new change of pastor at her parish. The new pastor of her parish has had experience with the Legion of Mary and is very open to the possibility of a praesidium in his parish. However, due to the fact that the summer was wearing down, Sr. Ciera did not move forward, afraid of creating a praesidium that she would soon have to leave to the new and adjusting pastor. Br. Benedict worked to recruit a few more legionaries, both active and auxiliary. 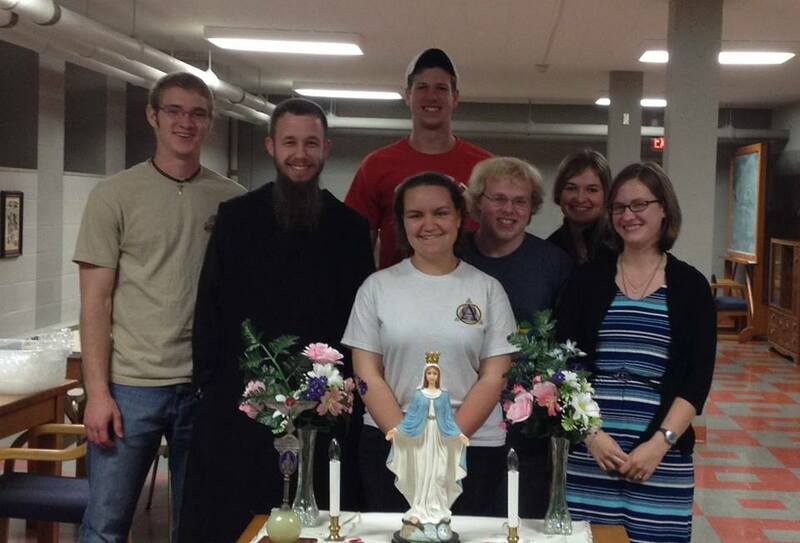 When the new semester began, the Legionaries quickly mobilized, holding a meeting the night after returning to BC. Our praesidium decided to change the time of the meeting due to the fact that our vice president, Nathan, is an RA and is on call that night, which would exclude him from meetings. Everybody’s schedules conflicted, but they were able to find a time at 2:00 on Fridays. A plan was set up to take advantage of the Ministry Fair and to get fliers up across campus to recruit. A pretty substantial number of legionaries helped with the ministry fair, which yielded the largest number of informational sign ups received.